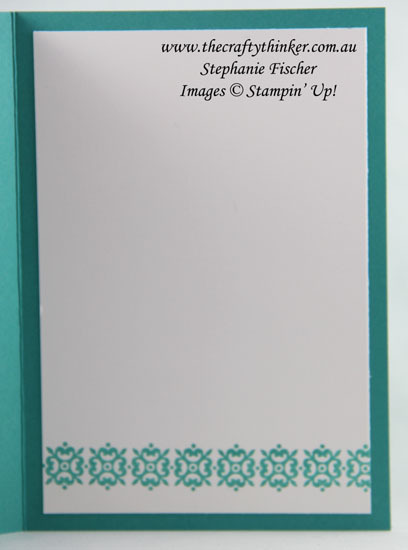 Glossy paper and dye ink are a marriage made in crafters' heaven! So many techniques are possible and the ink just glows! Having said that, the colours on this particular card look a little muted and that's because this is what I call a third generation card. It probably has a technical name but that works for me! When I get messy with anything (inks, embossing paste, glitter etc) I tend to make the most of the mess and create several pieces. This was one of the last pieces for the day and the colours had become muted and greyed through mixing.... but I still liked it. In days to come I'll show you the other pieces I made that afternoon. Again, I'm sure the technique for the background has a technical name but, since I don't know it, I'll simply describe the process I used. Using three different ink pads (in this case Elegant Eggplant, Bermuda Bay and Crushed Curry) I patted ink onto a waterproof craft mat. I then spritzed the ink with water until it had formed quite large beads. I pre-cut my Glossy White Cardstock to size and then pressed it into the ink on the mat. I then lifted it up, let it run a little and used a tissue (a clean one of course!) to soak up any excess ink at the edge of the cardstock. Since I'm somewhat impatient, I used my heat tool to dry the piece. Don't worry if the cardstock curls a bit. Application of some heat to the back of the piece may help or simply put it under heavy book for a short while. If a little bit of curl remains, it will sit flat once it has been adhered to another piece of card. 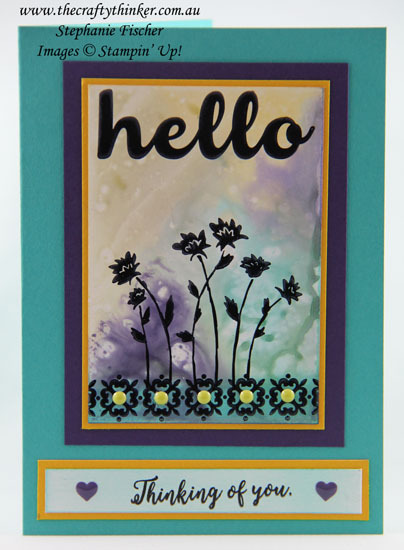 I used Basic Black Archival ink to stamp elements from the Background Bits stamp set and the greeting from the Hello Friend stamp set. Having used my heat tool again to ensure that the black ink was dry, I sponged a line of Bermuda Bay ink across the pattern at the bottom of the card to provide a little bit of a ribbon effect. Having added my Crushed Curry and Elegant Eggplant layers I added the piece to the front of the Bermuda Bay card and added some Enamel Shapes to the centres of the pattern. They are in fact Pear Pizzazz but they look more yellow in the photo. For the "thinking of you" panel, I lightly sponged a small strip of Glossy White Cardstock with Bermuda Bay before stamping the greeting (from the Colorful Seasons stamp set) using Basic Black Archival ink and adding some Elegant Eggplant Enamel Shapes.